This painting will be the image for the upcoming 2015 Texas Non-Game Stamp. Proceeds from print and stamp sales benefit wildlife habitat in the state of Texas. Black-necked stilts live in shallow marshes throughout much of the Western United States down through Central America. 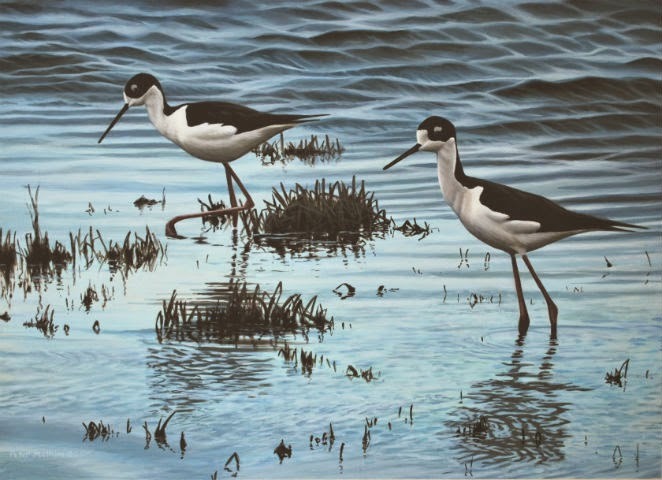 Their legs are very long enabling them to wade in a bit deeper water as seen in this painting. The background waves show the line where the water actually gets too deep for this pair but they are perfectly comfortable foraging for food in the foreground shallows.